Marcus, one of the key guys here, got married on the weekend. 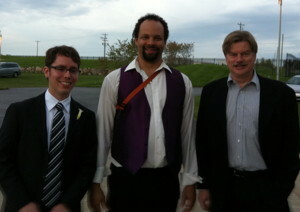 The picture shows James, Marcus and George at the wedding. After the ceremony, Marcus got up with his band and jammed on the saxophone. Congratulations, Marcus! Previous PostPrevious NS Basic/App Studio 1.2.2 released!